Sydney Shop Girl: From My Seat on the Train. 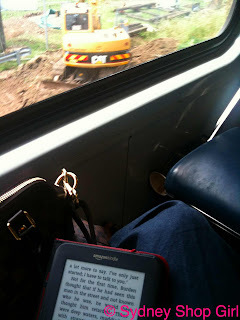 Those of you who rely on public transport to get to and from work on a daily basis, this blog salutes you. The ageing SSG-mobile was out of action for 2 whole working days this week. Like a resilient Hollywood starlet (I will not do a Gwyneth Paltrow and name names), it has aged well on the surface but its insides were another story. My car has had major internal surgery and though it hurt to see the bill, the good news is, we've got at least another 2 years on the road together. We've had some good times together: moved states, gotten married, passed exams, seen a Royal Engagement and glanced at numerous celebrity baby snaps. Back to the public transport issue. I don't know how you all survive - and come back for more, day after day. Necessity might be the answer. I just found it draining. More stressful than sitting in traffic in a car, to be honest. Figuring out train lines and platforms as well as the buses I needed to get to the station. Sometimes, even finding the entrance to some of the train stations was a challenge. But there were very pleasant moments. In the emptier carriages of the train, I could sit back and catch up on some reading with the soothing sensation of being bumped along over the train tracks as the CityRail equivalent of a relaxation CD. 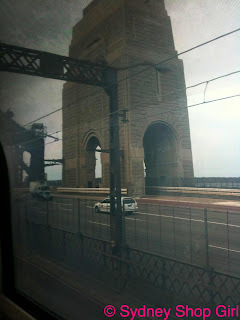 My train rides were also a ticket to seeing all walks of life in Sydney. The changes in buildings, landscape and people from one station to the next. So many stories untold and thoughts not yet given voice. Here and there, a gesture or a comment reminded me of someone I knew or something I'd done. I was reunited with my car yesterday afternoon and I was back in the driver's seat this morning on my way to work. It was quiet and peaceful. I had my preferred radio station(s) on (I'm a compulsive surfer - both the AM and FM bands) and I didn't have to listen out for train stops being called in the background. I was in my own little bubble in stop start traffic. It's what I'm used to but I'm glad I had those commutes on train. It is too easy to go about your day in a big city without really interacting with the environment around you. I was glad I the chance to engage on the train. I was just thinking of you when your comment appeared on my blog!! I was also thinking of you when I was wearing my new white jeans yesterday. Huh. So there you go. While I'm not reading about you every day, I'm still thinking about you!!! I catch a train each day. It's a 10 min trip to work and back. And though most days we're crammed like sardines, I find it less stressful than sitting in traffic. I like public transport, but I do find it draining on weekends when services are less frequent. Langdowns: good work re the white jeans! Carly: LOL, I am the reverse. I love public transport on the weekends! !